Dalchem distributes a range of polyester resins throughout Australia and New Zealand. A popular choice in our products is our clear polyester casting resin. Water clear polyester resin is suitable for use by any mould maker, sculptor, artist or enthusiast looking to cast glass like objects such as vases, trophies, chess sets, fishing lures, paper weights, plaques, lamp bases, jewellery, door knobs and novelty toilet seats. It is also suitable for embedding or encapsulating objects such as insects, metallurgical samples, plants/flowers & shells. The cast volume of clear polyester resin is limited by the exotherm generated by the curing reaction. This can cause the resin to discolour to a yellow or pink/purple colour if the reaction is too rapid. The resin can get so hot that it can start to fume and then crack. It is very difficult to document instructions to enable first time users to get a first class result without some experimentation. The main difficulty is the theoretical calculation of the correct catalyst ratio. Every job will require a calculated guess at a sensible catalyst level. It is recommended that you contact your local Dalchem moulding and casting specialist for further information. Any objects to be encapsulated, the resin and the moulds must be free of water contamination. Objects preserved in formalin or 70% alcohol may be superficially dried and may then embed as opaque objects. It may be desirable to view the object as translucent in which case it must be completely dehydrated. All objects other than those such as insects, which may be dried completely, must be preserved because of the decomposition action of anaerobic bacteria after they have been preserved fresh. Clear polyester casting resin is pre-promoted and generally requires only the catalyst MEKP to convert it to a solid state. The MEKP can be added at various levels to allow for ambient temperature, required cure time or mass of resin being cured. This resin contains Styrene Monomer and should be treated with care. Styrene Monomer is a known health hazard. Use only in a well-ventilated work place, preferably outside in the fresh air. MEKP(Methyl Ethyl Ketone Peroxide) catalyst is a very strong peroxide and should be treated with the utmost care. Do not allow contact with the skin or eyes. Wear suitable (nitrile rubber) protective gloves and close fitting eye protection. Have eyewash materials close by, either an eyewash bottle or a full bucket of clean water large enough to plunge your head into. If MEKP is splashed in the eyes you have only 4 seconds to wash the eyes to prevent damage. A good neutralizing solution can be made from a 2% sodium bicarbonate or freshly made 5% sodium ascorbate solution, followed by immediate medical attention. MEKP splashes on the skin should be immediately washed with soap and water. 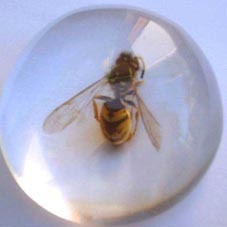 The clear resin may be clear dyed or opaque tinted. 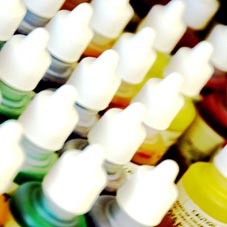 Opaque polyester gel coat pigments are suitable for tinting resin intended to form a base layer before placing an object on it and then covering with the clear resin. Clear dyes are available in either powder or liquid form. The powder dyes should be dissolved in a very small quantity of styrene monomer before addition to the resin. Not all dyes or pigments are suitable for polyester resin. The MEKP catalyst may react with the dye, which can then change colour. Be careful of greens and blues. Unsuitable dyes and pigments include: paints, universal paint tinters, food colourings, some inks, water-soluble pigments. Alcohol soluble dyes are often used to colour animal tissue, which is to be embedded. Borax carmine is used to produce a pink colour. For further information on dyes contact a Dalchem representative in Melbourne, or interstate. In the case of plants, the polyester will be affected by moisture in the plant. This moisture has to be removed. Unless special treatment is carried out, the colours will be bleached out of the final castings. To overcome these problems, drying and treatment with special colour preservatives is required. Two basic solutions for colour preservation are listed below. Preservation is a specialist area, these products are not supplied by Dalchem, and we provide this as information only. For blue or green flowers use Solution A. For red or pink flowers use Solution B. For intermediate colours use a mixture of A and B. Most flowers need immersing for between 10 and 20 hrs, after which time they become stiff and fragile. This treatment must be carried out at room temperature. At temperatures below 20°C, the addition to each solution of approximately 10 parts of normal butyl alcohol will be necessary. Wash in running water for an hour. Dry by gently rolling in tissues. Air dry for an hour, or immerse for a few minutes in absolute alcohol and then dry in a vacuum desiccator. Immerse in uncatalysed resin and transfer immediately to the embedding step. Dehydrate the object completely by passing through successive grades of alcohol, 30%, 50%, 70%, 80%, 90% and then absolute, preferably on successive days. Transfer the dehydrated specimens to uncatalysed resin until the required translucency is reached. Embed as before. In this way quite an amount of internal detail is revealed. The usual concentration of alcohol when used as a preservative is 70%. The normal procedure is to continue up through the dehydrating alcohols to absolute, soaking in uncatalysed resin and then embedding. Many of the exoskeleton objects may be dried from the 70% alcohol and then treated as a dry object. An alizarin transparency of a mouse. This is quite transparent in its glycerine solution, however will embed opaque because glycerine is not optically miscible with the clear casting resin. Transfer the object to 70% alcohol and follow on successive days to 80%, 90%, 95% and then absolute alcohol. The glycerine will now be removed. Transfer to uncatalysed resin, and when it sinks, it is ready to embed as described later. Dried echinoderms, bones, shells, insects, etc. The problem here may be eliminating air trapped in or around the object. Soak the object in uncatalysed resin and then embed. Catalysed casting resin may be injected into large empty body cavities. A vacuum desiccator may be utilised to carefully de-air these body cavities during the embedding process. A suitable mould is the first requirement. This should be as close to the required finished size as possible. The mould may be a purpose built RTV silicone, fibreglass or an existing plastic shape from the range of kitchen containers such as ice-block trays, plastic cups, egg poachers, disposable polyethylene(PE) or polypropylene(PP) buckets. Moulds made from plastic other than PE or PP will most probably be attacked or dissolved by the resin. Purpose built moulds may also be made from plastic or metal sheet. 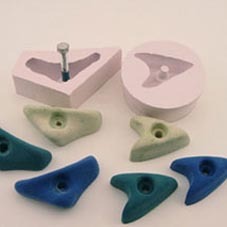 All moulds, other than PE or PP should be treated with a release agent. Liquid or hard paste wax, green PVA release agent, silicone oil, silicone emulsion, mould release waxes, and the PE packing tape, used properly, are all suitable as release agents. Plaster moulds should be treated with caution. Plaster has first to be properly dried and then soaked with a liquid wax. A number of applications of wax are required to realise the glossy finish required. Fabricated moulds must be totally leak free. Most embedding jobs will require a layer of gelled resin on the base. This is used to mount the object at a height above the base before pouring the remainder of the resin around and over the object. This gelled layer may vary from 2mm to 100mm or more. If the object to be embedded is heavier than the resin the gelled layer should be sufficient to support the object without sinking and remain sticky enough to allow bonding of the successive layer. 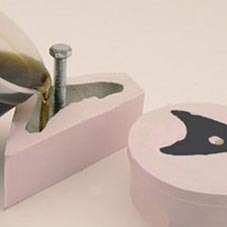 If the object to be embedded is lighter than the resin it will need to be rested on the gelled layer and left to cure further and thus stick the object to the base. The longer the base layer is allowed to gel the more apparent the interface of the next resin layer will be. The object may now be fully embedded with one or more covering layers. The number of layers depends on the total depth required. The following instructions are subjective to the size and complexity of the object to be embedded, if you have any doubts, do not hesitate to contact a moulding and casting specialist at Dalchem. When mixing MEKP catalyst into the resin it should be thoroughly blended. It is best to hand mix the resin with a flat, square ended paint stirrer. Scrape the sides and bottom of the container to ensure uniform blending. If the resin partially cures in some spots and remains liquid in others, there is only one explanation - the resin was not properly blended. Pour the catalysed resin in such a manner so as to avoid trapping air bubbles underneath the object being embedded. Small free-floating air bubbles may be removed with a syringe. Large bubbles should rise to the top before the resin fully hardens. The green tinge present in the uncatalysed resin will also disappear as the resin passes through the gelled stage towards fully cured. The time to gel depends on the mass and depth of the resin involved. 200ml of resin catalysed at 1% and then cast 5mm deep will gel at a different rate to that cast 50mm deep. The 50mm deep sample will most probably gel, overheat and crack because it cured too fast. The other variable is ambient temperature. The resin will cure faster in Summer than in Winter, therefore all Tech Data Figures are quoted at 25°C. 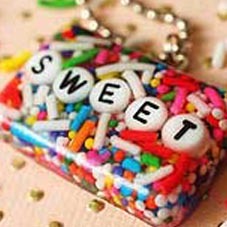 If the resin appears to be gelling too fast, the mould and its contents may be temporarily artificially cooled slightly. Placing the mould in a refrigerator, or in front of an air conditioner or fan until the cure rate is controlled may do this. Even though the above mentioned examples will both gel at about the same time(say 45minutes), the 50mm deep sample will fully cure much more rapidly(1hr) while the 5mm deep sample may take 2hr30min. The violence of the curing reaction is much more noticeable with larger quantities of resin. If the cure seems about to get out of control you should dispose of the resin mix in a bucket of water, This will cool the resin immediately and prevent the resin decomposing to a smelly, dangerous, toxic and smoky mess. Another method which can be used for some types of samples is one in which the sample is dip coated with resin having a high catalyst level. Here the resin gels and cues very quickly before the specimen surfaces have a chance to affect the resin. The specimen is not subjected to a high exotherm, which can force out volatile material. 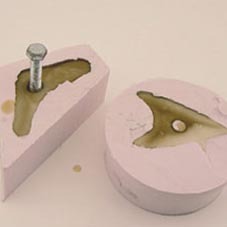 The coated specimen can then be embedded in a block after the resin coating has properly cured. 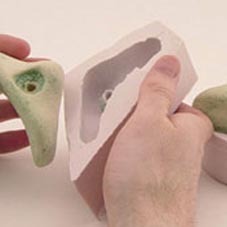 The casting may remain sticky on the surface even though the underlying resin is fully cured. This is entirely normal and is caused because the clear polyester resin is unwaxed. Wax is added to polyester laminating resin to exclude air and thus cure surface tack free. If wax were to be added to the clear resin it would not remain clear when cured. This surface tackiness may be overcome by covering the exposed top surface with a piece of cellophane while the resin cures. The same result may be obtained by spraying the tacky surface with PVA release agent. PVA release may be washed off with water prior to sanding and polishing. This surface tackiness may also be removed by wet sanding with wet and dry abrasive paper (W&D). As well as being surface tacky the resin may also have a very rough face. Start work on the surface with W&D of a grade sufficient to remove the surface irregularities (80 to 180 grit). Use several grades of W&D up to and including 1200 grit, removing the surface scratches caused by the preceding W&D. By the time you have finished with the 1200 grit the surface will be relatively clear. Finish polishing with a polish such as “Brasso”, a very fine buffing compound or plastic polish as used for “Perspex” acrylic sheet. All of our trained staff members at Dalchem in Melbourne are happy to assist in any enquiries you may have. Simply contact us by phone, fax or email, or visit our Melbourne showroom.